In the afternoon service at CRBC yesterday I gave a biographical message on the life of missionary pioneer Adoniram Judson. Thanks be to God, I can now say I have attained. I have knelt before him, with the last leaf in my hand, and imploring his forgiveness for all the sins which have polluted my efforts in this department, and his aid in future efforts to remove errors and imperfections which necessarily cleave to the work, I have commended it to his mercy and grace; I have dedicated it to his glory. 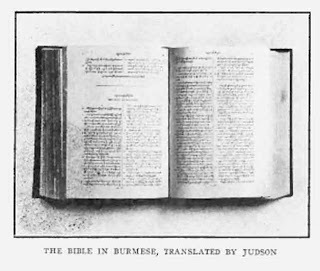 May he make his own inspired word, now complete in the Burman tongue, the grand instrument of filling all Burma with songs of praise to our great God and Savior Jesus Christ Amen (To the Golden Shore, p. 411).